Marwadi University is well known for its Innovative curriculum in an engineering field. One of the main curriculum is Electrical Engineering. Electrical engineering is the core field that deals with the production, maintenance, and distribution of electricity. This curriculum is designed in such a way that it can fulfill the following objective. In-depth understanding of concepts and principles of the field. New and innovative learning opportunities. Encouraging students to Develop new Technology. Imparting practical exposure to implement the concepts. To achieve these goals MU- one of the best Electrical engineering college in Rajkot employed the experienced staff in adherence with the latest industry standards. Students here are provided with the open resources in various labs like signal processing and Electrical Engineering labs. Electrical Engineering is the new emerging field in today’s world. Many students of this field are already serving both public and private sector and exhibiting their knowledge and skill. There is the wide scope of job opportunities in this field as electricity becomes a necessity now a day and it needs to be preserved for better future. It is the field with golden and wider career options. 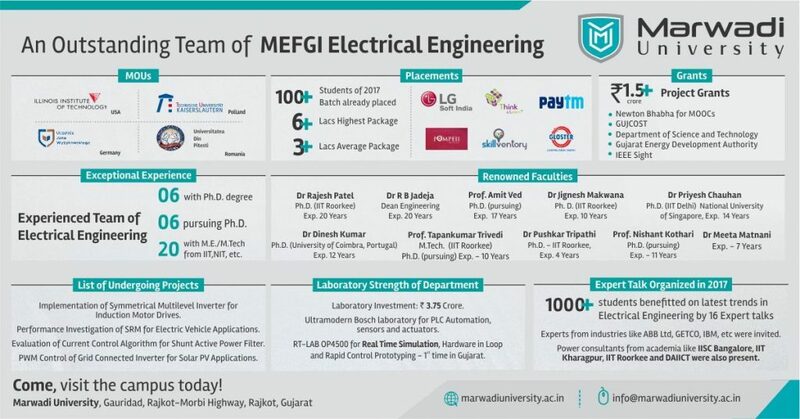 This Top Engineering College in Rajkot offers ample of job opportunities through on-campus and off-campus drives where students can exhibit their knowledge and skills and secure jobs with high salary packages. Many students of this department are already serving public and private sectors and exhibiting their skills and knowledge. More engineers are prepared on regular basis with an ultimate aim of serving the nation for its betterment. Ability to design machines in such a way that large of people are served with least investment and setup. Ability to devise efficient solutions including efficient hardware setup, distribution lines, monitoring, maintenance and several other tasks. Ability to follow and create innovative practices and production line that would save pockets as well as ensure better utilization of resources. A polished personality that can serve the nation in all aspects. Thus, popularly known as Best Engineering Colleges Rajkot, MARWADI UNIVERSITY paves the path of success for you during your stay in the campus. Electrical Energy is the only form of the energy which transmits over distance. Electrical Engineering is one of the oldest branch and is the base for many of technological streams. We cannot assume our life without electricity. Electrical Engineers can work with Government Sectors, Private Companies, as Consulting Engineers or as Entrepreneur in the field of research, design, projects, production, maintenance and testing etc. Requirement of Energy Audit, Renewable Energy Sources, Smart Systems, Automation etc has open up new exciting careers for electrical engineers. Objective of Electrical Engineering Department, Faculty of Technology is to prepare graduates as per industrial and societal needs. Graduates of the department will be skilled to work with latest technology including DSP, Microcontrollers, Power Electronics, Renewable, Modern Computer Tools etc. To achieve this goal, the department has team of highly qualified, committed and self motivated learners who will nurture the career of young and enthusiastic students as teacher, guide and mentor. Laboratories are equipped with equipments that are in line with current industrial trends. Teaching -learning process is well defined and is student centric. The department will constantly interact with scholars from industry , research organizations and academia to produce globally competent and locally relevant engineering graduate. Above these, department will nurture human values, sense of responsibility and ethics for all stake holders.